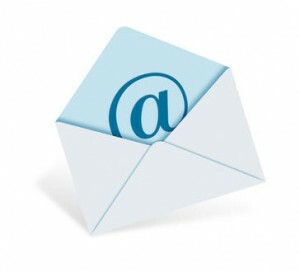 Hang on…so what’s happening on the 6th December? What should you eat on New Year’s Eve? How to spend New Year’s Eve and New Year’s Day? If you’ve already chosen Budapest to celebrate Christmas and New Year in 2018 we have good news: there are so many Christmas and NYE festivals to get yourself into the long-awaited Festive mood! Don’t miss the traditional Christmas Markets, they are the absolute highlights during this magical month. Just to name a few of the most festive activities, you can also go ice-skating on the largest natural ice rink in Europe as well as watch The Nutcracker in a beautifully decorated art theatre. 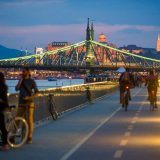 For a complete list please read our article 10 unique reasons to visit Budapest in December. The Christmas and gift-giving season starts relatively early compared to other European countries. In early December a Santa-like figure, Saint Nicholas (Mikulas) traditionally visits the homes of Hungarian children to celebrate the tradition of Saint Nicholas Feast Day. Although the role of gift-giver on Christmas Day itself is assigned to the Christ Child, on 5th December Hungarian children traditionally clean a boot and place it on their windowsill waiting for Mikulás to come by and fill it with treats. Mikulás often comes with an assistant called “Krampusz”. He represents the Devil who punishes naughty children. The morning of 6th December is the official start of the gift-giving period, although Hungarians don’t until the 24th December. Before 24 December, people decorate their houses and start cooking and baking – with the previously explain food culture in Hungary you can now expect that Christmas in Hungary is all about food. It’s 24th December when people start decorating the tree with colourful ornaments and put the wrapped presents under it. As opposed to most European countries, in Hungary the gift-giving happens on Christmas Eve when young children are waiting for the arrival of Baby Jesus. The family exchanges gifts after the dinner and after singing carols around the tree. On Holy Night, Hungarians listen to holiday songs such as “Silent Night” and sing or attend Christmas mass. As an old tradition we also burn candles on the Advent wreath during the four weeks before Christmas, lighting up one more new candle each Sunday. The Vörösmarty Square Christmas market is the oldest and richest of all the Christmas markets in Budapest. The Crafts Market is open from 9th November all the way to 29th December after which the food stalls remain open until 1st January 2019. There are about 100 stalls waiting for you to visit them, set around the Christmas tree that is decorated with different colours each year. From gulash to grilled sausages there is an endless selection of local food you can enjoy. Not a surprise that the market puts a great emphasis on food and wine which is truly Hungarian way to celebrate the Festive season. 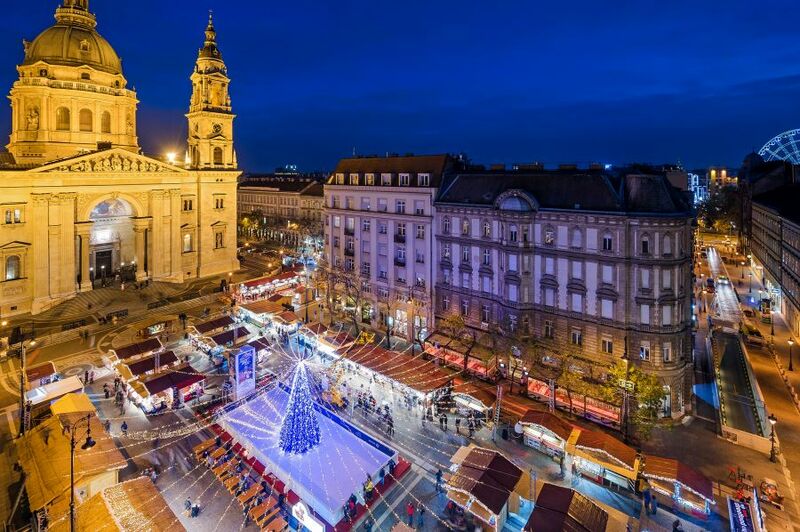 Set in the most stunning part of Budapest, St Stephen’s Basilica’s Christmas Market is the one not to miss. 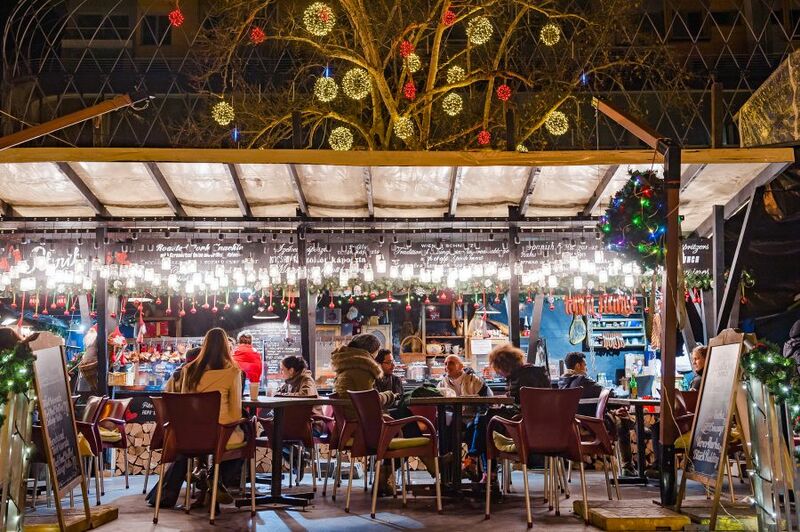 Enjoy a (unique) mug of mulled wine alongside with roasted chestnut and warm and hearty street foods (beyond sausages) and enjoy the lights and the flavours. During your visit, tasting mulled wine is unmissable. This heart-warming drink has become one of the must-haves of the Christmas markets that await with a wide variety of mulled wine selection (white, red or even rose!). For a little deposit you’ll get a customised annual addition mug which you can refill with your choice of drink. You can keep the mug as a piece of memory of the Hungarian Christmas market or you can decide to return the mug and be refunded with the deposit. Alongside mulled wine chimney cake (kürtős kalács) is a true Hungarian legend that makes people addicted for hundreds of years. Chimney cake has a perfect crisp exterior and a soft inside making the most delicious dessert for the cold winter evenings. What’s even better it is coated in cinnamon and sugar. For a unique and fairy-tale-like way to explore the city hop on tram line 2 which will be one of the highlights of your stay. The tram is lit up from the early afternoon, around 4 pm with over 35.000 white and blue LED lights that creates a stunning visual experience as the tram slowly strolls alongside the Danube. 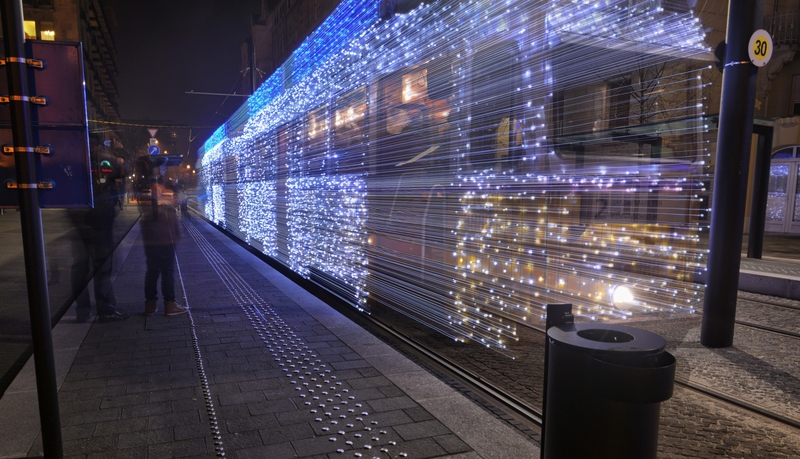 The journey is available with regular public transport tickets and passes, and in addition to tram line 2, several other lines across Budapest will be lit up, including tram 4, 14, 19, 47, 50, 56A, and 59. 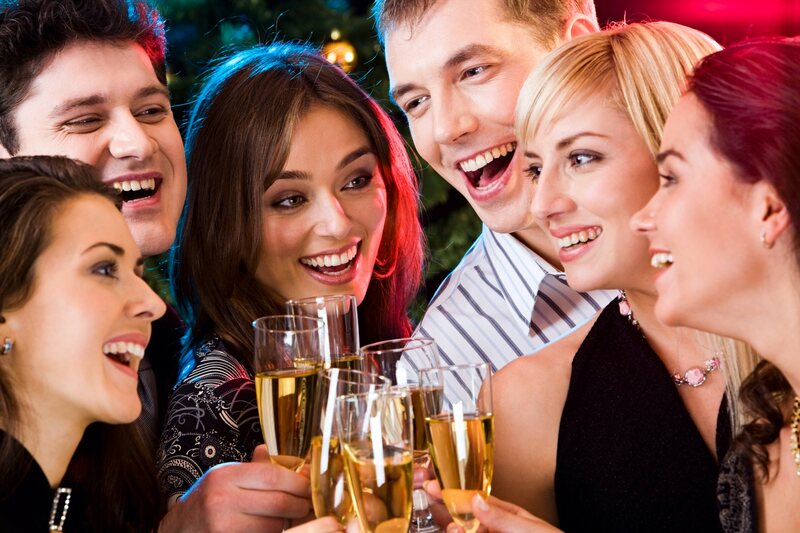 New Year’s Eve is when festivities reach their zenith as people dance and celebrate the New Year. You can attend several carnivals and concerts already on the 30th December – see, Hungarians love to party so the earlier you start, the better. However, please be careful celebrating early as New Year’s Eve will still await with lots of awesome places to go to! On the 31st December, a masked ball is held at the Opera House and there are lots of exciting parties and gala dinners held across the city. Even though Budapest is rather grey and cold in winter the end of December undoubtedly brings back all the colours and excitement to people’s lives. 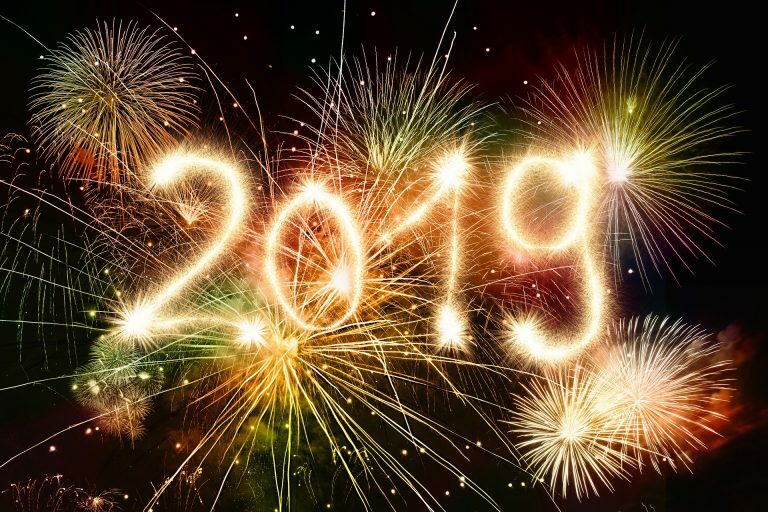 In Hungary New Year’s Eve and New Year’s Day traditions have interlocked with the aim of bringing health, wealth, fortune and happiness to the next year by doing magic. Many people make a scone-like cheesy cake (pogácsa) and hide a coin in it. The one who gets the piece with the coin will be very fortunate next year. People also made garlic calendars to forecast the next year’s weather. They put salt on the 12 cloves that represent the 12 months. The clove that gets the dampest represents the rainiest month of the upcoming year. Girls tried to foretell who’s going to be their future husband by putting names into dumplings. They then cooked them in boiling water, and the one that first came to the surface contained the right name. Housework and arguing were forbidden on this day because it meant misfortune. Eating poultry is bad luck because hens scratch backwards. You should be careful with fish as your luck might drift away with it. Our food is full of tradition – especially on special occasions. Following the traditions, of course the NYE dinner also needs to tell a story. Lentils – they symbolize the wealth, and happiness in the new year. So every Hungarian needs to eat at least a spoon of lentil soup, or pottage. Pork – roasted pork brings fortune and luck. But you have to eat from strange pork parts, like nose, knuckle, ears, tails. Moreover, from the weirdest Hungarian dish, called kocsonya, which is a jellied broth with pork parts. Sausages, frankfurter – easy to cook and eat at a house party too with ketchup, mustard and white bread. Deviled egg – hard-boiled eggs with yolk mixed with mayo and mustard. It’s an appetizer, a normal party food. 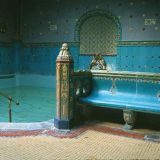 Hungarian wine and champagne awaits you with all their qualities, after a nice dip in one of the city’s best thermal baths. There are many types of parties you can choose from whatever your preferences are: an elegant gala dinner, a small group celebration in a cozy bistro or crowded parties in high end nightclubs? Budapest nightlife is famous for its diversity and New Year’s Eve brings no exceptions. You usually have to book well in advance, especially in popular places. If you have no reservation, go early and pray to get in. Most places serve a substantial dinner that includes special dishes with a glass of champagne that is often included in the price. Hotel Gellert is where all the magic happened for centuries – stunning exterior, prime location and astonishing style will treat you to an outstanding experience. This year they will bring all the joy and celebration by throwing a stylish gala dinner to say goodbye to 2018. Dinner will be served from 7 pm with the recommendation of Gabor Muncz, the hotel’s master chef. At 9 pm the dance floor will open with star guests who will guarantee an unforgettable night. 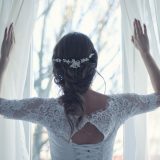 For prices and more details check out Gellert Szilveszter. 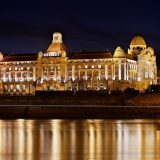 The impressive building of the Danube Palace in central Budapest traditionally hosts an exclusive New Year celebration where you can enjoy a 5-course dinner with the best selection of local wines, beers, champagne alongside a 2-hour classical concert with dance and ballet performance. New Year’s Eve wouldn’t be real without stunning fireworks. As the Danube mirrors the colours on its surface the fireworks are just wonderful to look at both on the sky and on the water. The best places to watch the fireworks is either close to the river (don’t forget to bring warm clothes) or on a river course, but Fisherman’s Bastion in the Castle District also provides an excellent panorama of the city. Vörösmarty Square: December 31st is the final day of the city’s favourite Christmas Market so saying goodbye to 2018 will also mean the official end of the Festive period. The square will be busy with both locals and tourist taking the last sip of mulled wine of the year. Gellért Hill: If you’re feeling active on New Year’s Eve why not climb up to Gellert Hill to say goodbye to the year with one of the most iconic views of the city? A prime spot to watch the fireworks too! Nyugati Square: the heart of the city is the perfect place to mingle. This place guarantees the buzz and the loudest cheer for the New Year. The concert hall of the Danube Palace (Duna Palota) hosts two wonderful concerts on 1st January starting. You can enjoy a 70-minute performance by the Danube Chamber Orchestra which celebrates this special day with timeless classical pieces by Mozart, Liszt or Gershwin. At 20.00 a 90-minute Concert & Dance Show comes alive on the stage presented by the Danube Symphony Orchestra, the soloists of the Budapest Operetta Theatre and gypsy folk artists. 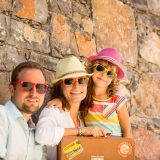 Celebrate the New Year on a sightseeing cruise on the Danube – Reward yourself and your family with a wonderful evening that includes a splendid five-course dinner, live music by the Hungarian Folk Ensemble & Orchestra, and the enchanting sights of illuminated Budapest that you can see on a 2-hour trip. The New Year’s Day boat excursion is hosted on the spacious and elegant Europa Ship. Shorter days and longer nights, crisp mornings and freezing evenings are expected as Budapest slowly turns into a fairy tale winter wonderland in the end of November. 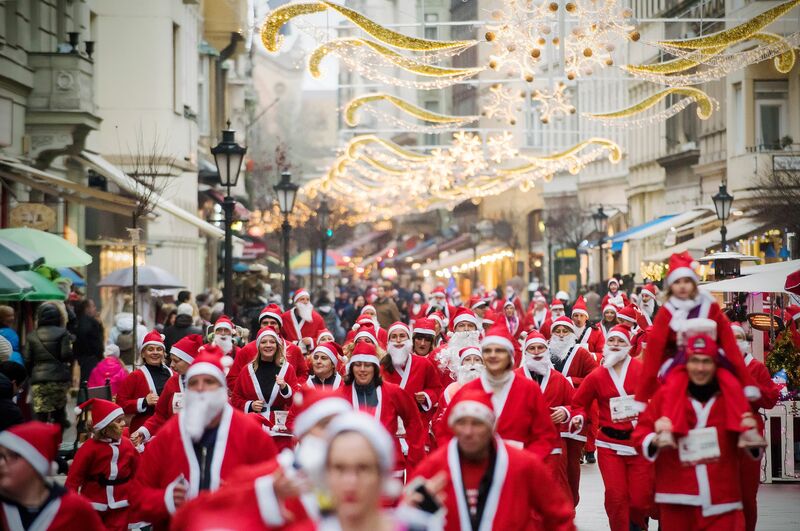 To feel the Christmas spirit and get festive the Hungarian capital is the perfect place even after New Year’s Eve. 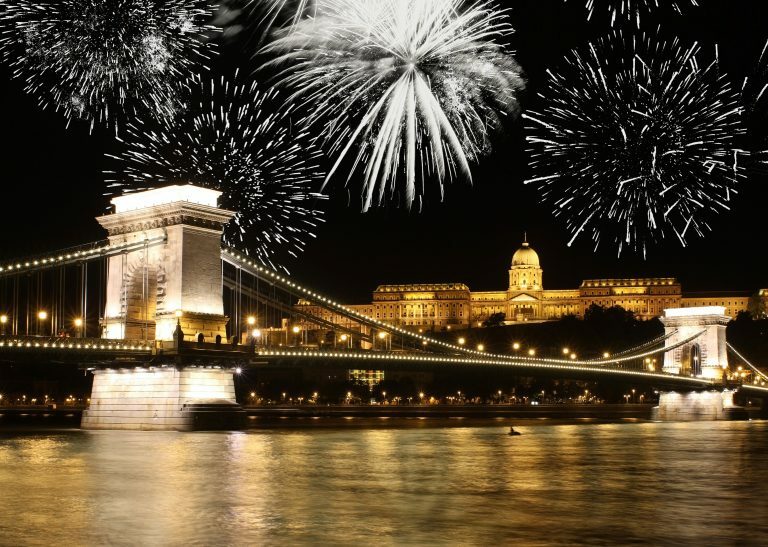 Celebrating the New Year in Budapest you can enjoy the steadiness until the end of January. It is an ideal time to go as there are less tourists and the city is just waking back up from the festive period. 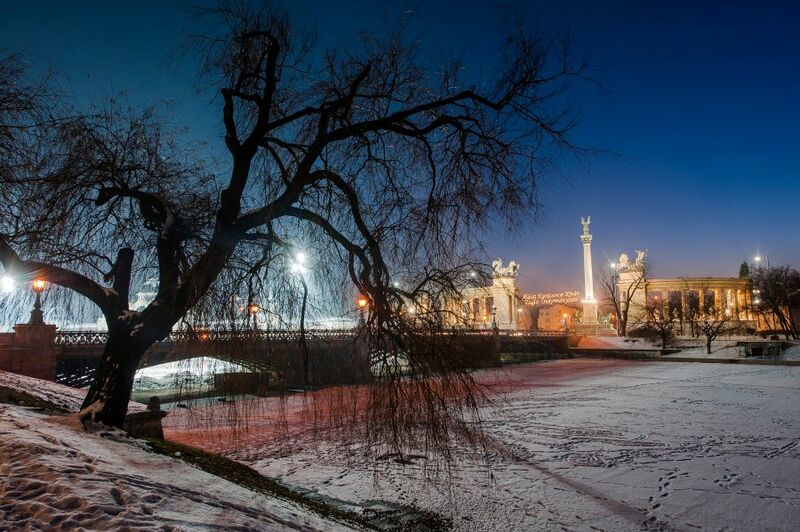 If you’re lucky there is even snow, lots and lots of snow so you can enjoy sledging down the Buda hills as well as the absolutely picture-perfect scenes around the capital. December is one of the coldest months of the year in Budapest so expect cold weather conditions and occasional frosty biting wind. Snowfall is frequent but not too heavy – enough to make the landscape absolutely beautiful. Cold urban destinations in Eastern Europe will introduce you to a different kind of winter where a very warm jacket, a chunky scarf, a hat and some warm gloves are crucial besides making sure you wear plenty of layers. You’ll be spending time visiting outdoor fairs and markets and it may be freezing out on the streets, so you always want to keep warm. However, in museums and cafes you might want to lose some layers and feel nice and cosy. Astoria City Center that opened in 1914 as one of the city’s most elegant hotels, and – over a century later – it stays true to that original character. Guests have always been attracted by its sublime fin-de-siècle architecture and comfortable rooms. 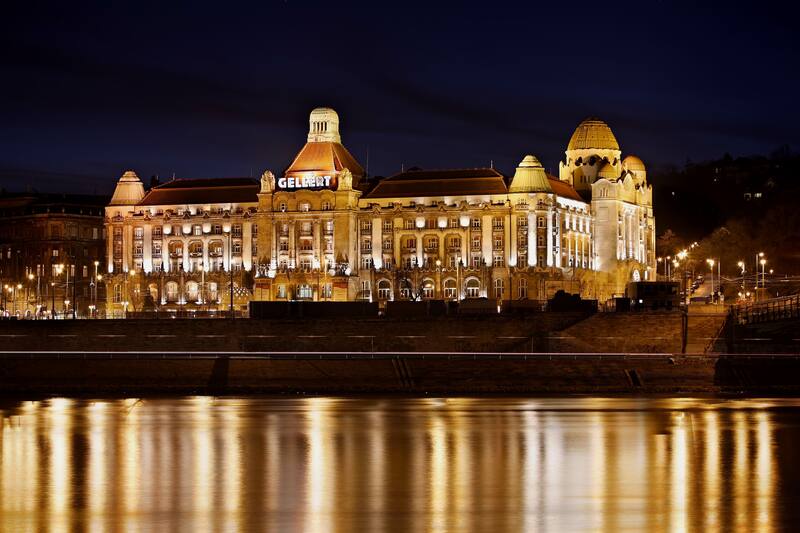 The location of the hotel is perfect if you want to stay close to the city centre as it is only a 10-minute walk from prime attractions like the Hungarian National Museum, the Great Synagogue, the Danube promenade and the famous Váci Street. 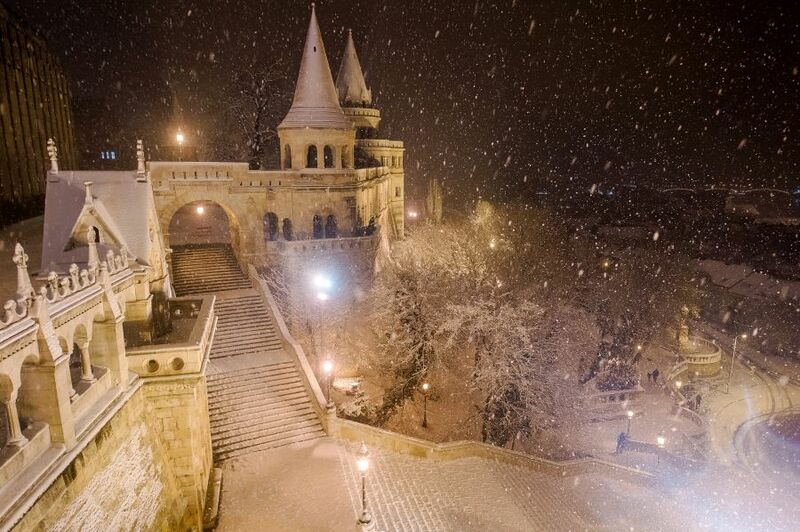 In December Budapest is all dressed up in lights and traditions. From Christmas to New Year’s the city is your playground to explore, mingle, celebrate and make lots of memories whether it is a special meal, an unforgettable party, learning to say “cheers” in Hungarian or getting a gentle shiver after your first taste of Palinka. Hungary inspires and we promise: it will never be forgotten.